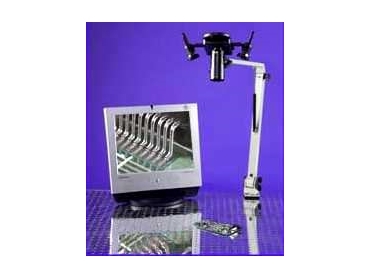 SATURN’s high resolution magnifier reduces fatigue associated with glass lens magnifiers and traditional microscopes. Saturn magnifiers are available from CLC Tech with working distances from 6" to 26" (15 to 65cms) and magnification between 1.75x and 168x. The varifocal lens give an in-focus working depth of 6" (15cm) while the adjustable camera head allows an extended viewing range and unique viewing angles. Incorporating one of the frame grabber cards or non-contact measurement software allows process documentation. Images can be archived and retrieved direct to a PC or sent with text via e-mail. Saturn magnifiers can also be configured to display images direct to a monitor or via a PC.